Celebrated for its awe-inspiring landscapes, pristine environment and remote and rugged beauty, the geography of Milford Sound makes it a truly special place to visit. Milford Sound is a long narrow inlet located at the northernmost end of Fiordland National Park, opening out onto the Tasman Sea. The length of Milford Sound is approximately 16km (9.94 miles) from the head of the fiord to the open sea, which means visitors can comfortably travel along it to the open ocean and return on one of the many Milford Sound cruises on offer. In places the fiord is up to 400m (1,312 feet) deep. The rocks that make up Milford Sound and the surrounding Fiordland region were once part of a huge mountain range on the megacontinent of Gondwanaland, over 600 million years ago. Over the course of hundreds of millions of years, they were reshaped by erosion and the movement of tectonic plates deep under the earth. 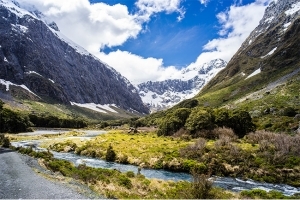 Fiordland National Park, along with Mt Aspiring National Park, Aoraki / Mt Cook National Park and Westland National Park, makes up Te Wahipounamu, a World Heritage Site. Te Wahipounamu is recognised by UNESCO as an ecologically significant area, with a wide range of geographical features and an unspoiled ecosystem that allows unique and rare wildlife to flourish. The early European settlers named this place Milford Sound – but they were incorrect. Milford Sound is actually a fiord, not a sound. Sounds are formed when a river valley is flooded by the sea, whereas Milford Sound was formed by the erosion of ancient glaciers. Within the last two million years, there were around a dozen major glacial phases in the South Island. Rivers of ice up to two kilometres wide descended from the Southern Alps and flowed slowly but surely down to the sea, carving their course out of the solid rock as they went. Later, as the earth warmed, the glaciers retreated and the ice rivers melted. 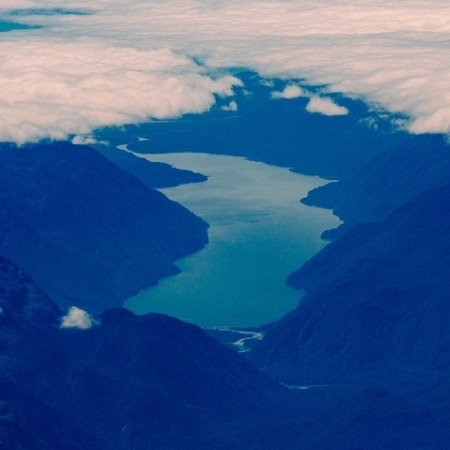 In some places the trenches and valleys they left became lakes, including lakes Te Anau and Manapouri. In Milford Sound they created a fiord: a sheer, narrow valley opening out to the sea, with high cliffs on either side. You can see the passage of the glaciers over time in the shape and height of the cliffs that rise out of the sea. As years went by and the glaciers melted the thickness of the ice changed, resulting in the ridged walls and U-shaped glacial valleys you can see today. As the glaciers started to retreat back towards the mountains, they left behind huge deposits of the rock and debris they had brought with them down the mountains. There is a terminal moraine deposit or ‘sill’ at the mouth of Milford Sound, leaving the floor of the fiord just 27m deep at this point (compared with over 300m deep on either side). This sill forms a barrier which stops big ocean swells from coming in, keeping the waters inside relatively calm. The most common rock types in Milford Sound are gneiss (in many areas containing large garnet crystals) and diorite, with some granite. There is also pounamu or greenstone around Milford Sound, also known as nephrite or jade. This was formed by the recrystallisation of minerals within rocks deep below the surface of the earth, due to the enormous heat and pressure caused by tectonic shifts hundreds of millions of years ago. More movement later on brought these rocks to the surface and exposed the greenstone. You can see some of these greenstone deposits from above on a scenic flight, particularly near the western mouth of the fiord. Natural features of Milford Sound include the many peaks which surround the water. At the pinnacle of Milford Sound is iconic Mitre Peak – standing a proud 1,692 metres above sea level, it is certainly an impressive sight to behold. It was named after its resemblance to a bishop’s mitre (head-dress). Interestingly, its unusual summit is actually made up of five separate but closely grouped peaks. Other distinctive peaks around Milford Sound include The Elephant (1517m) and The Lion (1302m), both named for the animals they appear to represent. Gushing down from the surrounding rainforest into Milford Sound are myriads of cascading waterfalls, some reaching a thousand metres in length. Many of these fluctuate depending on rainfall. There are two main permanent waterfalls in Milford Sound: Lady Bowen Falls (162m high) and Stirling Falls. Lady Bowen Falls provides a source of both water and electricity for the residents of Milford Sound. Because the waterfalls appear at their best after or during rain, Milford Sound is perhaps even more beautiful in bad weather. Find out about Milford Sound weather. Read more about the highlights of Milford Sound.